The team at Gold Coast Watersports have all your exciting watersports activities in the one fantastic location, inside the award winning SeaWorld Resort. Experience the thrill of riding a Jetski around a purpose built circuit, or go on one of their exciting guided island Jetski tours, try the ever popular parasailing or jetboat ride, they also have kayaks and stand up paddleboards as an add on extra to one of their popular watersports, or be the envy of all your friends with the latest craze to hit Australia's shores, the all new FlyBoard or Jetpack Extreme experience. All the activities are safe and easy to operate and you do not need any previous experience or special licences - just bring photo id on the day. They also have free locker facilities and free use of the pool at Seaworld Resort. Let the friendly and experienced staff at Gold Coast Watersports make your stay on the Gold Coast truly memorable. The latest craze to hit Australia's shores has finally arrived. Gold Coast watersports proudly presents Flyboard Extreme and Jetpack Adventure! It is surprisingly easy to fly like Iron Man and dive like a dolphin with this amazing new experience. After a short briefing, their friendly staff will have you up in the air usually within a few minutes. You will be the envy of all your friends and have some amazing new photos to put on your facebook page. It is your time to shine! Experience the adrenaline rush when you try this great package. Combining a Jet Ski adventure as well as parasailing and you have an exciting, action packed adventure on the Gold Coast that you are sure to enjoy. The only way to fully appreciate the true beauty of the Gold Coast Broadwater is to soar majestically up to 80 metres above it. After a short boat trip and briefing, you will don your life jacket and safety harness and be winched high in the air. You will then spend a magical eight minutes sailing high above. Check out the Surfers skyline and watch all the boats passing below. Ah the Serenity. Get wet or stay dry the choice is yours. After your sky high experience you will be safely winched back to the boat. Back at their wharf you will receive a short safety briefing before given your life jackets and then set loose on one of our latest Yamaha Waverunners. You are definitely in for a lot of fun as you dart around their one kilometre course. Prepare yourself for pure adrenaline with their awesome Jetski Island Safari Adventure tours. Experience the beauty of South Stradbroke Island and the impressive mansions of the Gold Coast on the latest model jetskis. Your adventure will start with a full safety briefing and a couple of test laps on their jetski circuit to get the feel for the jet ski. They then travel approximately 30 to 70 kilometres depending on the length of tour - along South Stradbroke island where you enjoy spotting kangaroos and other wildlife on the sandy shores. Heading up the inside of South Stradbroke island meandering through narrow mangrove channels towards Couran Cove and Tipplers Channel. On longer tours they have a brief stopover then mount your ski's and head north to Jumpinpin , west to Jacobs Well, then returning via the impressive multi million dollar mansions of Sovereign Islands. Discover the Sovereign islands on a rich and famous house tour before having some more thrills and spills on their way back to Seaworld. Their latest model Yamaha Waverunners are easy to drive so you can enjoy an ultimate rush. All you need to bring on the day is your enthusiasm and a sense of adventure! Great Package deal combining a five minute Flyboard introduction each person and tandem parasail for two people to share. Fly high like Iron Man and dive like a dolphin with the newest extreme watersport activity that is taking the world by storm. It's easier than it looks and their friendly and experienced staff will have you up and flying, in most cases in under eight minutes. Your experience starts with a safety briefing and being kitted out with wetsuit, helmet and lifejacket. You will then learn the basic manoeuvres including taxiing through the water, turning left and right around the instructor and then standing up! Then Jump on board their specially designed parasailing boat and take your seat. From this vantage point you will be parasailing over the beautiful broadwaters and be able to see the Surfers Paradise skyline, the Q1, South Stradbroke and WaveBreak Islands, the Gold Coast Seaway, the mountains of the Gold Coast hinterland including Springbrook and Tambourine Mountains. Experience pure adrenaline as you speed around their purpose built one kilometre circuit aboard the latest model Yamaha Waverunners. These awesome machines are the latest Yamaha Waverunners models. Located right on the shores of the idyllic water sports playground that is the Broadwater, the experienced staff at watersports will have you on the water and on your way to an experience you'll never forget. Extreme fun. No special license or experience required. A 15 minute Flyboard introduction for each person: fly high like Iron Man and dive like a dolphin with the newest extreme watersport activity that is taking the world by storm. The Fly Board is simillar to a skateboard with bindings attached, which is then attached to a jetski via a 20 metre hose. The thrust from jetski and gives the Fly Board's propulsion while the hirer controls the direction. A tandem parasail: jump on board their parasailing boat and take your seat. When the conditions are perfect the skipper will flick the release and you will be winched at a controlled rate high into the air, beginning your parasailing adventure. From this vantage point you will be parasailing over the broadwaters and be able to see the Surfers Paradise skyline, the Q1, South Stradbroke and WaveBreak Islands, the Gold Coast Seaway, the mountains of the Gold Coast hinterland including Springbrook and Tambourine Mountains. A 30 minute jet ski hire to share: enjoy the adrenaline rush of riding a high speed jetski their purpose built circuit . Race around a one kilometre track as fast as you like! You can take turn at driving the jet ski with your partner. Fly High and Stay Dry or Fly Low and in you go! Parasailing is a great activity and an absolute Must Do for everyone. Tick this off your bucket list with Gold Coast Watersports. Jump on board their specially designed parasail boat for the experience of a lifetime. Get a birds eye view of Surfers Paradise, the hinterland and the isolated islands of the beautiful Gold Coast. Soar like an eagle as the clear blue waters flow 100 metres beneath your feet. Enjoy nature spotting including wallabies on the beaches of South Stradbroke Island and the majestic dolphins, turtles and stingrays in the broadwater. Totally safe and relaxing and a great activity to share with a friend or loved one. Ultimate package deal including twin share 30 minute jet ski hire around the course, Tandem Parasail, five minute flyboard session per person and 45 minute jet boat ride. First enjoy the adrenaline rush of riding a high speed jetski their purpose built circuit. Race around a one kilometre track as fast as you like! Then jump on board their specially designed parasailing boat and take your seat. 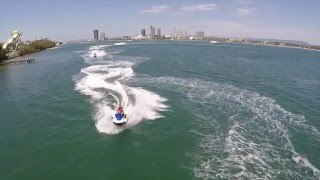 Next, brace yourself and hold on for an exhilarating 45 minute jet boat thrill ride on the beautiful Gold Coast Broadwater, as you take in the sights of the waterfront mansions, sandbanks and pristine beaches. Experience pure adrenaline high speed and more 360 degree spins than you can imagine as you spin, slide and jet your way! Finally try the latest craze with a five minute flyboard session per person. It is surprisingly easy to fly like Iron man and dive like a dolphin with this amazing new experience.